This IS the Bourbon you’ve been looking for. Heaven Hill Distillers is unique. They are one of the oldest and largest Bourbon distillers in the world, they have the second largest standing inventory of aging Bourbon, and they have grow to become the seventh largest supplier of spirits in the US. BUT … they are still family owned. In fact, they are the only family-owned production house left in Kentucky. God bless the Shapira family! The spirit brands owned and controlled by Heaven Hill includes Evan Williams, Elijah Craig, and their namesake Heaven Hill, and many dozens more. Old Fitzgerald 9 year old is a very special Bourbon. It’s not “just” a Straight Bourbon, it’s also Bottled in Bond — with all the rules, covenants, codes, and restrictions that such a designation implies. This is a biannual release (twice per year, Spring and Fall) and it’s a bit different each time. You can tell the different because each release has a different color label. This release — with a black label — is a nine year old beauty bottled at 100 proof (50% ABV). The mach bill has no rye — it’s 75% corn, 20% wheat, and 5% malted barley — making this dram smooth as can be. What does Old Fitzgerald 9 Year Old Bottled in Bond Bourbon taste like? 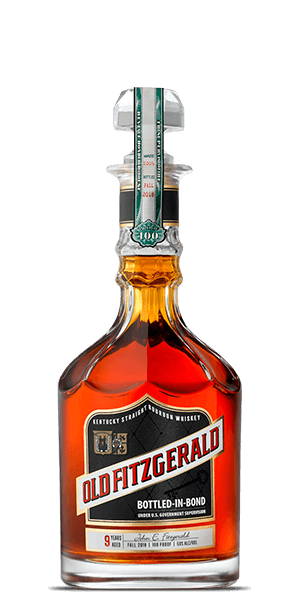 The Flavor Spiral™ shows the most common flavors that you'll taste in Old Fitzgerald 9 Year Old Bottled in Bond Bourbon and gives you a chance to have a taste of it before actually tasting it. The aromas are classic Bourbon with vanilla, grains and oak with a bit of apple and notes of pecan pie. As you expect with a Bourbon of this age and quality, the mouthfeel is really rich and full and the flavors abound with pralines, butterscotch, and florals. The finish is sweet and warming with oak and sultanas.